On September 25, 2014 at 1:00 p.m., the Galloway Township Police responded to Absegami High School for a reported “credible threat” inside the school. The threat was reported to Police by the district superintendent as the threat was against student’s safety. Students were evacuated via early dismissal at approximately 1:15 p.m., and faculty was evacuated from the building. K-9 Officers from Stockton College Police, Cape May County Sheriff’s Department and the New Jersey State Police assisted the Township with a check of the High School for any existing threats. The building was cleared and no one was injured as a result of the threat. The incident remains under investigation by the Galloway Township Police Department and Greater Egg Harbor School Officials. Don't you put a building on lockdown during a bomb threat? Once law enforcement completely sweeps the building for explosives, that is when you evacuate. Was it a bomb threat? No mention here. I know the press mentioned bomb but if it was a credible bomb threat, why wasn't the Fire Department brought out? Anonymous at 7:02 Are you serious? If there is a bomb threat you stay inside the building so that if a bomb does go off you can get yourself killed! You get out and stay as far away as possible and let them sweep an EMPTY building! The students were informed at 1:10 that they had to leave by 1:15 to get on their buses. But the buses AND their drivers were already in position by 1:10 or earlier. How did the school mobilize the buses into position by 1:10 when they normally aren't taking the kids home until 2:40. Wouldn't this mean that the school established the credibility of the threat well before 1:10? Why wouldn't they get the kids out of the school via fire drill immediately? How long were the kids in the school after the threat was established? This system needs work or we may be setting ourselves up for a disaster.. Anonymous 9/26/2014 @ 3:01 PM, under NJ state guidelines for a bomb drill, you are supposed to pull all kids out of the hallway, secure the door, and hide in the furthest corner of the room from the door. Why would you put countless lives at risk by evacuating a building when there is a great potential for an active shooter? This serves as a prime example as to why law enforcement personnel should make the decision as to whether or not to clear a building. These school administrators couldn't plan a safe graduation for two consecutive years. Something went wrong here and it needs to be addressed. 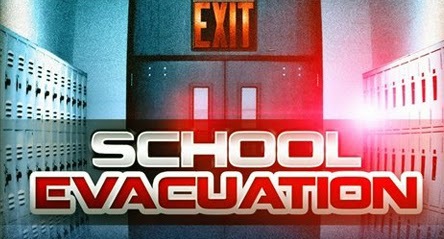 Under NJ guidelines, a school administrator can either evacuate the building or put the building on lock down. There is too little information in this case to argue what would have been better to do. However, in today's working world, building lock downs are seen as more effective than evacuations when it comes to bomb threats. This is the procedure used on military bases and large office buildings and it should be used universally. Why? Because in today's world, individuals who pose a threat use bomb threats so they can easily attack a large group of individuals or law enforcement personnel while they are evacuating a building. Fortunately, nothing was found in this case, but we need to fix the emergency response procedures.